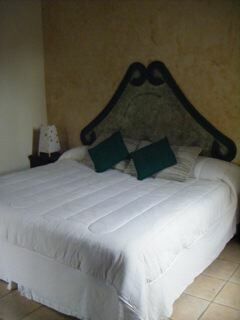 It's a hotel with a mixture of Colonial style of Guatemala and todays comfort facilities. The house is located in a quiet area of Antigua Guatemala, away from the city center's noisy movement but a few steps to the biggest attractions like History sites, market place, shopping centers and restaurants. In Hostal Las Marias you will feel at home with an excellent service, "everything you deserve in a place created with feeling your visit". Central Park. 5 blocks walking. Your reservations will be confirmed as soon as we receive your credit card information, however, no charge is made until you arrive. A fax signature may be required sometimes to confirm your stay. Any cancellations made 1 week prior to the arrival date will not be charged. All cancellations made within a week or less will be subject to a one night penalty for each room reserved. For Easter Week and New Years Holidays (High Season), all cancellations should be made 5 weeks prior to the arrival date. Anytime within these 5 weeks is subject to a full charge.